Our colour laserprinter is a quiet workhorse in the corner of our lab. Most of our sessions rely on printed scripts for attendees to follow and so we need a reliable printer. We chose an HP colour laser printer which is designed for small workgroups and it’s wired into our network. It’s has a duplexing unit so it can print on both sides of the paper so we try and keep paper-use down a little bit. We also have a consumer inkjet printer which prints to photographic quality and a monochrome laser printer. Neither as well-used as the colour laser but they have their place. Hints & tips: some printers refuse to work as soon as they detect that ink/toner is low. We like our HP printer because it warns us about toner level but doesn’t insist we change it. We change the cartridges only once we notice print quality decline. We usually get a couple of months’ extra life from toner in this way. A Robox 1st generation small printer which made set up and printing very simple for beginners. 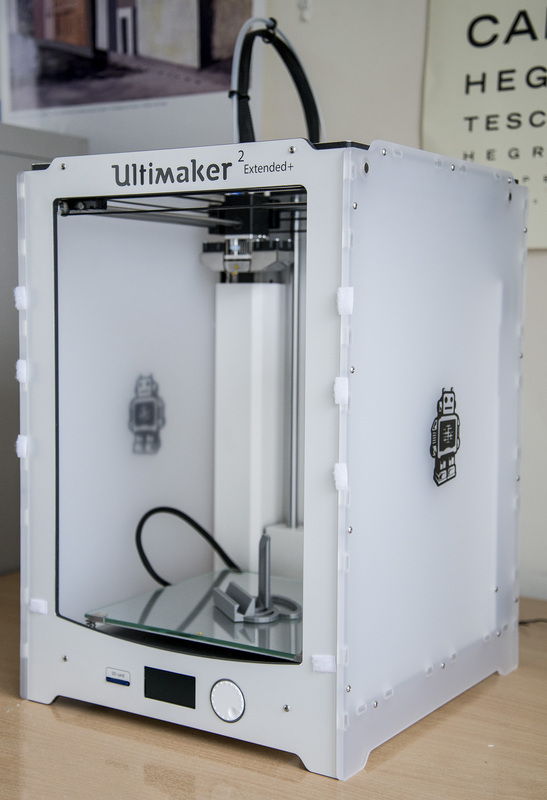 We use the Ultimaker the most but it does need a dry, warm environment to work at its best. The Up Mini 2 had a shaky start since it failed (twice) very shortly after we got it. Now, however, it does good service at “away” sessions. We’re still very fond of the Robox printer but it has become cranky and difficult and so has to be closely monitored. As a result it’s currently on my kitchen table and is pressed into service when a project needs a long/overnight print which we can’t leave running in our lab. Generally we use PLA filament since it’s the most reliable. ABS is good but we find it a bit finicky to work with. We’ve also tried TPE (flexible) filament but need to spend more time with it to learn how to get the best from it. Bed adhesion can be a problem on the Ultimaker but we use Dimafix: a miracle substance which is sticky when hot, but not when cold. Means it holds your print firmly whilst printing but lets go as it cools. Genius! Our 3D printers are safe for use by young people with a bit of caution. We think it’s really important for youngsters to learn all aspects of the technology they’re using so we train them how to use them and what bits they need to be careful with. Hints and tips: sticking to one type of filament is probably the best way to ensure your 3D printer works smoothly. Storing filament in inexpensive vacuum storage bags with some silica gel helps keep it in good condition. Sometimes you want to cut materials with precision. We bought a kit CNC router on a large bed base to allow us to cut and carve a variety of things. We’re lucky that we have a confident engineer who is happy to learn and build things. Over a period of a couple of weeks he built our router and learned how to use it. During that time he also determined that it wasn’t the sort of machine many people should be using on their own. As a result we encourage people to design for it – but Sam actually machines the project. We’ve built frames and signs, we’ve milled out windows in enclosures and RF antennae from PCB material. We don’t use it all that often but it’s the perfect tool for the job when we do! We bought a laser-cutting attachment for it but we haven’t used it because it scares us a bit! Hints and Tips: Make sure you know where the big red kill button is – especially if you forgot to home the stepper motors before you started. Also it makes a LOT of noise and mess – place it accordingly. Pillar drill: This looks a bit scary if you’ve never used one but it’s easier than a hand drill – especially when you’re teaching youngsters how to drill. Hand drill: We favour a cordless drill for maximum flexibility. As well as drilling holes in things and tightening screws ours is frequently put to work in making up twisted-pair wires. Hot air gun: One of these is vital if you’re using heat shrink tubing on wires. We tried using a hair-dryer (too cool), a paint-stripping gun (too hot) and a soldering iron (too inconsistent and gets muck on your tip) before buying a proper one. Staple Gun: Great for attaching fabric to a wooden frame, or posters to a noticeboard but needs to be kept away from small hands. It’s terrifying! Manual hand-tools: tenon saws, mitre saw, hacksaw, junior hacksaws, screwdrivers, side cutters, crimpers, craft-knives, socket sets, vices, clamps, spanners, precision screwdriver sets, pliers. These are invaluable for all projects. You’ll always need more than you think because they “move”. Bench Power Supplies: For some projects, or to learn about electricity you need a mains powered, safe and reliable power supply. We’ve got a mixture of single and double ones and they get used a lot. They protect against short circuits and are voltage and current limited to make sure no one gets too daft with them. Sewing Machine: For projects with an element of sewing in them you need a sewing machine. We bought a starter machine. It’s great for basic sewing tasks. Make sure to keep all the extra pieces of kit away from the rest of the lab’s kit – the pieces will be repurposed for other jobs and really, fabric scissors need to be kept just for fabric! Vacuum Cleaner: Possibly rather unexciting as tools go but if you’re cutting anything you’ll make a mess. Encouraging workspace users to clean up the mess they create is made easier with a vacuum cleaner near to hand. Actually, we have two: one small and light and one a bit heavier duty. If we had our time again we’d probably have bought a lasercutter as well. We currently don’t really have the space (or the spare cash) for one but it’s definitely on our wishlist. Our next post on this subject will list “all the other stuff” that our makerspace has ended up housing.